If you decide to take any photos or information from this website, please include my name (Ryan Wadleigh) and url address as a citation. Thank you. Our Bennett family is probably English in origin. The name Bennett is said to be derived from the Medieval given name Benedict, which originated from the latin word Benedictus, which means "blessed." James Bennett was born circa 1667 in Connecticut. He died after 1699 in Virginia or Maryland. His origins are unknown, but he may have been the son of James Bennett of New London, Connecticut. He came to Stratfield, Fairfield County, Connecticut, where he married Mary Couch Grumman in the mid-1690’s. James and Mary had three children: Elizabeth, Mary, and Benjamin (see next generation). James was a shipwright and lived at Stratfield. Unfortunately, in about 1699, James abandoned his wife and children and moved to Virginia or Maryland to be a shipwright and was never heard from again. James and Mary were divorced in 1703. She afterwards remarried to Samuel Jennings. James married Mary Couch circa 1696 in Connecticut. She was born circa 1671 in Fairfield, Fairfield Co., Connecticut. 1 Elizabeth Bennett was born before May 10, 1696 in Stratfield (now Bridgeport), Fairfield Co., Connecticut. 2 Mary Bennett was born before May 10, 1696 in Stratfield (now Bridgeport), Fairfield Co., Connecticut. Benjamin Bennett was born probably in early 1697 in Stratfield, Fairfield County, Connecticut. He died in Stratford, Fairfield Co., Connecticut. He was baptized at Stratfield on April 4, 1697. In 1699, Benjamin’s father abandoned the family and his parents were divorced and his mother remarried to Samuel Jennings. On January 28, 1724/5 in Stratford, Connecticut, Benjamin was married to Hannah Curtis. Benjamin and Hannah had 10 children: Thaddeus (see next generation), Mary, Hannah, Benjamin, James, Hannah, Sarah, Eunice, Sarah, and Ann. Benjamin died in Stratford, Connecticut at an unknown time. Benjamin married Hannah Curtis on January 28, 1724/5 in Stratford, Fairfield Co., Connecticut 1. She was born on August 14, 1705 in Stratford, Fairfield Co., Connecticut 1. 2 Mary Bennett was born before January 1726/7 in Stratford, Fairfield Co., Connecticut. She married David Beardsley. 3 Hannah Bennett was born in February 1728/9 in Stratford, Fairfield Co., Connecticut 1. She died circa 1730 in Stratford, Fairfield Co., Connecticut. 4 Benjamin Bennett was born before August 1731 in Stratford, Fairfield Co., Connecticut. 5 James Bennett was born before April 1734 in Stratford, Fairfield Co., Connecticut. She died before 1771. 6 Hannah Bennett was born before February 1736/7 in Stratford, Fairfield Co., Connecticut. She died before 1771. 7 Sarah Bennett was born before April 1741 in Stratford, Fairfield Co., Connecticut. She died before 1747 in Stratford, Fairfield Co., Connecticut. 8 Eunice Bennett was born before April 1745 in Stratford, Fairfield Co., Connecticut. She died before 1771. 9 Sarah Bennett was born before September 1747 in Stratford, Fairfield Co., Connecticut. She married Solomon Plant. 10 Ann Bennett was born circa 1750 in Stratford, Fairfield Co., Connecticut 1. Thaddeus Bennett was born on July 4, 1725 in Stratford, Fairfield County, Connecticut 1. He died on January 21, 1777 in Stratfield (now Bridgeport), Fairfield Co., Connecticut 1,3,8,9. Thaddeus was a farmer and a shoemaker and lived at Stratfield, Connecticut. He was married there on May 14, 1751 to Elizabeth Wilson. They had 5 children: Thaddeus (see next generation), Joseph, Grizell, Sarah, and Silas. At the outbreak of the American Revolution, Thaddeus enlisted in the Connecticut Militia. He was a Captain in of a train band. In August 1776, he went with his company to New York City to help defend the city against the British. The company suffered considerably, but Thaddeus survived. He returned to his home but died soon after on January 21, 1777, at the age of 51. Thaddeus married Elizabeth Wilson on May 14, 1751 in Stratfield (now Bridgeport), Fairfield Co., Connecticut 1. She was born before April 2, 1732 in Stratfield, Fairfield Co., Connecticut. She died on November 16, 1815 in Stratfield, Fairfield Co., Connecticut 3,8,9. 2 Joseph Wilson Bennett was born circa 1752 in Stratfield (now Bridgeport), Fairfield Co., Connecticut. He died in 1813 in Stratfield (now Bridgeport), Fairfield Co., Connecticut 1. He married Sarah in 1778 1. 3 Grizell Bennett was born on May 25, 1761 in Stratfield (now Bridgeport), Fairfield Co., Connecticut. She died after 1838. She married Iaac Odell on April 25, 1781 1. 4 Sarah Bennett married Nathan Fairchild. 5 Silas Bennett was born circa 1767 in Stratfield (now Bridgeport), Fairfield Co., Connecticut 1. He died on April 24, 1853 in Southford, New Haven Co., Connecticut 1. He is buried in the Southford Cemetery, Oxford, New Haven Co., Connecticut. Thaddeus Bennett Jr. was born on August 23, 1753 1 or August 23, 1758 3,8,9 in Stratfield (now Bridgeport), Fairfield Co., Connecticut. He died on January 8, 1831 in Newtown, Fairfield Co., Connecticut 1,3,4,5,8. He is buried in the Zoar (Berkshire) Cemetery, Newtown, Fairfield Co., Connecticut. Most sources indicate that Thaddeus was born on August 23, 1758 3. Different records indicate though that he was baptized on March 17, 1754 in Stratfield, Connecticut 1. Either 1) the birth date was wrong and he was really born in 1753 (a "3" could easily look like an "8" in written records), 2) there was another child named Thaddeus who died sometime between 1754-1758 or 3) the baptism date was wrong. His widow's 1840 pension application makes a strong case that he was actually born in 1758, she described him as being two years older than her and 24 at the time of their marriage (which points to a birth in 1758). Thaddeus spent his youth in the vicinity of Stratfield (now Bridgeport), Connecticut. During the American Revolution, he served as a private under his father Captain Bennett and Colonels Lewis and Whiting. He married Martha Hall in 1782. It is unclear where Thaddeus and Martha's children were born. The Barbour Collection vital records of Fairfield, Stratford, Weston, Trumbull, Shelton and Newtown do not record their births. In 1789, Thaddeus was listed as living in Weston, Connecticut (they were probably in the part of Weston that became Easton in 1845). In 1790 they were enumerated in the nearby town of Fairfield. In 1800, they were living in Trumbull, a town that had just been carved out of Stratford in 1797. Then in 1810 they were living in Huntington, the town directly east of Trumbull. By 1820, they had moved to the town of Newtown, Connecticut, where they remained. Thaddeus married Martha Hall on February 28, 1782 in Stratford, Fairfield Co., Connecticut 1,3,8. She was born on December 3, 1760 in Weston, Fairfield Co., Connecticut 1,3,8,9. She died on May 12, 1842 4 in Fairfield Co., Connecticut. She is buried in the Zoar (Berkshire) Cemetery, Newtown, Fairfield Co., Connecticut. Martha "Patty" was the daughter of David Hall and Lydia Wildman. In 1840, when she applied for a pension for her husband's Revolutionary War service, she was a resident of Monroe, Connecticut. She was probably living with one of her children there. 1 David Bennett was born on January 20, 1783 3 in Fairfield Co., Connecticut. He died on August 8, 1868 in Westford, Windham Co., Connecticut 3. He is buried in the Knowlton Cemetery, Ashford, Windham Co., Connecticut. 2 George Bennett was born on July 15, 1785 3 in Fairfield Co., Connecticut. He died on March 16, 1866 in Oxford, New Haven Co., Connecticut 6. He is buried in the Brookside Cemetery, Quaker Farms, Oxford, New Haven Co., Connecticut. George was a resident of Newtown, CT when he married Sarah in Oxford in 1811. They apparently settled in Oxford immediately afterwards In 1860, he was working as a syth maker. Only the name of his daughter Mary is found in burial records. The other (possible) three children were extrapolated from early census records. 3 Elijah Bennett was born on June 25, 1787 3 in Fairfield Co., Connecticut. He died on September 26, 1836 3. 5 Thaddeus Bennett was born on October 17, 1790 3 in Fairfield Co., Connecticut. We can find no further information on this person. He may have been the Thaddeus Bennett who married Deborah (maiden name possibly Lewis) probably in the 1820's and had one known daughter: Harriet. This Thaddeus apparently died in Fairfield, CT sometime during the 1840's. His daughter Harriet married John Buckingham and lived in Fairfield. 6 Lydia Bennett was born on June 4, 1793 11 or July 30, 1794 3,8,9,12 in Trumbull, Fairfield Co., Connecticut. She died on July 2, 1879 in Newtown, Fairfield Co., Connecticut 11,12. She is buried in the Zoar Cemetery, Newtown, Fairfield Co., Connecticut. Lydia and her husband settled in Newtown, where they lived next to her parents Thaddeus and Martha Bennett. Lydia remained in Newtown for the duration of her life. Her son Luzon B. Morris was the governor of Connecticut from 1893-1895. 7 Eli Bennett was born on June 30, 1799 3 in Fairfield Co., Connecticut. He died after 1870 in Neversink, Sullivan Co., New York. The IGI suggests that Eli Bennett was married to Deborah Carr and lived in NY, yet that couple was from a different generation. 8 Minerva Smith was born on January 13, 1802 3 in Fairfield Co., Connecticut. She died on December 28, 1823 in Newtown, Fairfield Co., Connecticut 3. 9 Wildman Bennett was born on July 20, 1804 3 in Fairfield Co., Connecticut. He died on July 13, 1871 in Bronson, Branch Co., Michigan. Betsy Bennett was born on March 7, 1789 3,8,9 in Fairfield County, Connecticut. She died on February 27, 1842 2,10 in Williams Twp., Sangamon Co., Illinois. She is buried in the Fancy Creek Cemetery, Fancy Creek Twp., Sangamon Co., Illinois. Betsy was probably born in the town of Weston, Connecticut, where her father was listed as being a resident the same year she was born. In Weston, they were probably in the part of the town that became Easton in 1845. Or she was born in the neighboring town of Fairfield, where the family was enumerated in 1790. The Bennett family moved around quite a bit to different towns in Fairfield County, Connecticut before settling permanently in the town of Newtown in the early 1810s. Betsy lived in the towns of Weston (Easton), Fairfield, Trumbull, Huntington (Shelton) and probably Newtown. In 1811 or 1812, a young man named Reuben Merriman returned to Connecticut from a trip to Kentucky and decided to find a wife. He and Betsy Bennett were married on May 4, 1812, according to family history. Although no known town records their marriage, they were probably married in Newtown or Monroe. We know that the Bennetts settled in Newtown sometime between 1810-1820 and the Merriman family history indicates that they were married about 20 miles from Bridgeport (which is about the distance between Bridgeport and Newtown or Monroe). Betsy and her husband immediately left Connecticut and moved to Kentucky with the Merriman family. They settled off of Big Eagle Creek in Scott County, Kentucky, where Reuben engaged in milling and coopering. 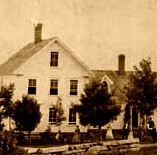 It was at this location that six of Betsy's children were born. For whatever the reason, they did not stay in Kentucky for long. Perhaps their reason to move was the same as Abraham Lincoln's family; they did not approve of the slavery in that portion of the country. The move was hastened in the late 1820s by the death of Betsy's father-in-law, Amos Merriman. In the fall of 1829, they left Kentucky and moved to Sangamon County, Illinois (the same place where Abraham Lincoln settled). They settled on a farm in Williams Township, several miles northeast of the city of Springfield. The Merrimans were quite successful farmers in Illinois and Reuben at one time owned 810 or 830 acres of land there. They were members of the Bethel Baptist Church in Sangamon County. Unfortunately, both Betsy and Reuben became ill during the winter of 1841-1842 and died within a day of each other from "winter fever" (pneumonia). Betsy was only 52 years of age. Betsy married Reuben Merriman on May 4, 1812 in Fairfield Co., Connecticut 2. For information on their children, see his page. 1. Jacobus, Donald L. History and Genealogy of the Families of Old Fairfield. Genealogical Publishing Co.: Baltimore, MD, 1976. 2. Powers, John C. Early Settlers of Sangamon County, Illinois. Edwin Wilson & Co.: IL, 1876. 3. Bennett, Edgar B. The Bennett Family: 1628-1910. East Berlin, CT, 1910. 5. The Barbour Collection of Connecticut Town Vital Records, Volume 31, Newtown Vital Records 1711-1852. 7. The Barbour Collection of Connecticut Town Vital Records, Volume 25, Monroe Vital Records 1823-1854.